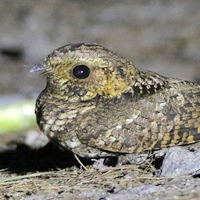 Nightjars are medium-sized nocturnal birds in the family Caprimulgidae, characterized by long wings, short legs and very short bills. They are sometimes called goatsuckers, due to the ancient folk tale that they sucked the milk from goats , or bugeaters, due to their insectivore diet. 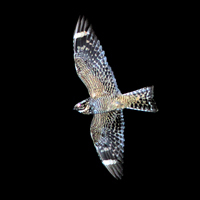 Some New World species are called nighthawks. 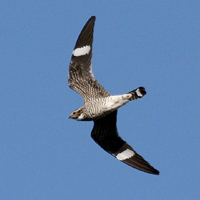 The English word 'nightjar' originally referred to the European nightjar. 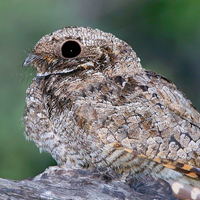 They are mostly active in the late evening and early morning or at night, usually nest on the ground, and feed predominantly on moths and other large flying insects. Most have small feet, of little use for walking, and long pointed wings. Their soft plumage is cryptically coloured to resemble bark or leaves. Some species, unusual for birds, perch along a branch, rather than across it. This helps to conceal them during the day.